Square Enix's attempt to shift the Front Mission series from turn-based strategy role-playing game to third-person shooter was finally playable to the public at Tokyo Game Show. That gave us a chance to see just how Front Mission has "evolved." The demo that we played—once on the PlayStation 3, once on the Xbox 360—was largely the same as the hands-off demo Square Enix and developer Double Helix showed at Gamescom last month. That meant lots of Wanzer on Wanzer action, plus a taste of the on-foot, outside-the-mech gameplay. 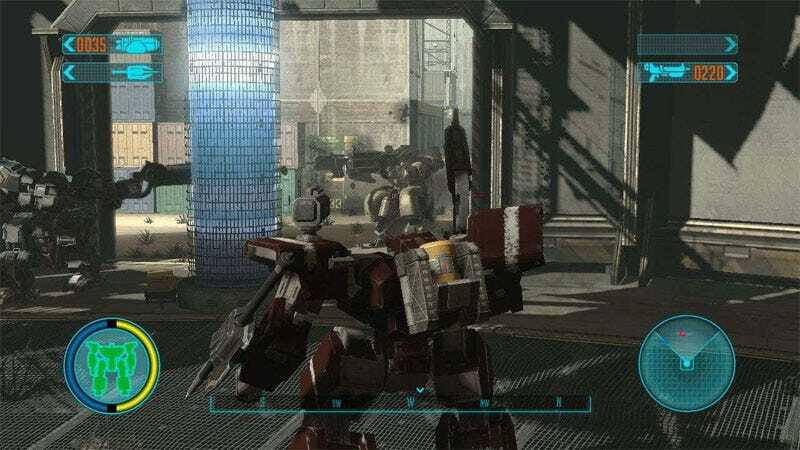 First, we played the PS3 version, picking the "medium assault" class mech that came pre-loaded with a semi-automatic rifle and lock-on missiles. That class of Wanzer also came equipped with a nasty right hook, one that we relied on when the rifle ran out of ammo, a constant plugging of enemy mechs having drained our supply. Fortunately, the TGS demo appeared to be pretty liberal with the bullets. The action, as we'd previously reported, was not exactly "blistering." It was methodical, walking through what appeared to a loading dock and other industrial areas, regularly met with enemy forces. Fortunately, we had an AI-controlled co-op buddy helping us out. And we quickly became accustomed to the "skate" controls, essentially a little turbo boost, letting the Wanzer slide through a level at faster than walking speed. On the second play through, this time on an Xbox 360, we picked the Sniper class. As you're probably going to guess, this class came armed with a sniper rifle and one of those handy barrage missile launchers. It was also decked out with a repair backpack. Whenever the Wanzer was looking worse for wear, a quick press of the B button would heal the thing. That, combined with a constant drip of ammo and enemies that weren't very challenging, didn't add much tension to the giant mech gunplay in Front Mission Evolved. Sure, you can strategically shoot off legs and arms to slow down and disarm enemies, respectively, but what's the point? We felt pretty comfortable just tossing a few target-seeking missiles at our foes and keeping the trigger pulled. Technically, though, Front Mission Evolved appears to be capable. It's not the flashiest game, graphically, with lame explosions and bland environments, but it gets the giant mech job done. Controlling the Wanzers were simple. Evolved doesn't ask much of your controller dexterity, at least based on what we played in the TGS demo. Oh, there's one more thing. After successfully killing a few dozen enemy Wanzers, the Tokyo Game Show demo offered us a look at the on-foot portions of the game. We simply had to walk through a few corridors, gunning down anyone who wasn't our character. Two weapons were offered, an assault rifle and missile launcher. The latter was to be used against the Wanzer that was air-dropped in at the climax of the demo, so we're not sure if it feels as feeble as the standard issue rifle. At this point, these on-foot sections feel less polished than when piloting a Wanzer. The camera and controls during these portions felt looser, less reliable. It reminded us from a presentation standpoint of the Earth Defense Force series, but less frantically fun than that third-person shooter. While the Wanzer piloting portions of Front Mission Evolved weren't spectacular, the mechs do have a sense of heft to them. The action may be lead-footed, but it is appropriately slow and chunky. It took some effort on our part to add variety to the combat, but it wasn't wholly unenjoyable enough to make the second play through a chore. The segments of the demo played outside of the mech, however, definitely stood out as needing further attention. The TGS demo dated Front Mission Evolved for a Spring 2010 release somewhere, giving the developers some time to improve upon some of the game's current faults.